According to a new market report published by Transparency Market Research titled “Tennis Ball Machines Market – Global Industry Analysis, Size, Share, Growth, Trends, and Forecast, 2018 – 2027,” the global tennis ball machines market was valued at US$ 26.0 Mn in 2017 and is expected to reach US$ 33.6 Mn in terms of revenue by 2027, expanding at a CAGR of 2.9% from 2019 to 2027. The Asia Pacific market is projected to show the fastest growth rate during the forecast period due to the increase in number of tennis players and product innovation among manufacturers. The usage of tennis ball machines has increased across the world. Tennis was perceived as a game for rich people and this trend has been changing over a period of time. Many kids have started to play tennis from an early age, encouraging them to eventually play the game professionally. After the Beijing and Rio Olympics, China is investing in the development of sports and tennis players. Tennis machines used to be costly and afforded only by a few people or by sports clubs and federations. These machines earlier were heavy to carry. Portable machines are now available in the market due to various innovations and developments in tennis ball machines. These machines are comparatively less costly than traditional machines which were heavy and non-movable. By type, light weight tennis ball machines have the highest growth opportunity as these machines are more user friendly compared to the heavy weight ones. They are easy to handle and carry and makes it a perfect consumer choice. Moreover, light weight machines are a perfect fit for young and amateur tennis players to start from scratch. By ball capacity, tennis ball machines having capacity of less than 150 accounted for major market share of 35% in 2017. One of the increasing trends in the lawn tennis industry is proliferation of young tennis players. With the entryof inexperienced and amateur players in the industry, tennis balls with low ball capacity proves to be a perfect fit for young tennis players. By speed, tennis ball machines having speed of 20 mph to 80 mph acquired greater market share of approximately 50% in 2017 and is further anticipated to rise at a CAGR of 3.1% during the forecast period. By power, battery operated tennis ball machines are more convenient due toadvantages such as low maintenance, portability, as well as affordability compared to electric powered tennis ball machines. By end-user, sports clubs which include sports academies, clubs, and hotels and resorts garnered major market share of approximately 54% in 2016. Tennis ball machines being costly are more feasible for sports clubs compared to schools, colleges, and personal use. Better infrastructure facilities coupled with trained and experience coaching facilities in sports clubs make it a more convenient training option. By distribution channel, the offline distribution channel has major market share. Tennis ball machines are sold by leading players globally with the help of licensed distributors across various regions with strong physical presence. In certain regions such as Asia Pacific, e-commerce sites mainly lead the distribution channel due to strong internet penetration, and extensive product availability at affordable prices. Geographically, in terms of revenue, North America accounted for major market share of approximately 40% in 2017 followed by Europe. This is due to popularity of tennis as a sport since ages. 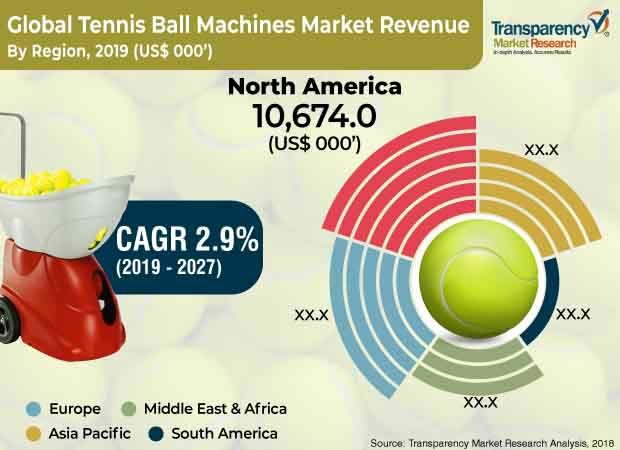 Additionally, presence of better infrastructure, government initiatives by funding for tennis sports training across various schools and universities, coupled with initiatives of popularizing tennis among the younger generation have resulted in the dominance of the region in the tennis ball machine market. The tennis ball machines market consists of a large number of private players. Industry players focus on developing new products to satisfy the changing consumer demands. Product innovation and advancements in technology are the key competitive strategies adopted by top players in the tennis ball machines market. Ace Attack, Deuce Industries Limited (Silent Partner Tennis), Dongguan SIBOASI Sports Goods Technology Co., LTD, Lobster Sports, Inc., Metaltek (Playmate), Spinfire Sport, Spinshot Sports, Sports Attack, LLC, Sports Tutor Inc., and Staber Industries, Inc. (Match Mate Tennis) are the key companies profiled in the research report. The report also offers a competitive landscape of the key players in the tennis ball machines market.